I always forget about Chicken Salad Sandwiches. These look awesome, Jane! I kind of forget about them, too…and then I make it and it’s always so yummy! need to remember it more often! 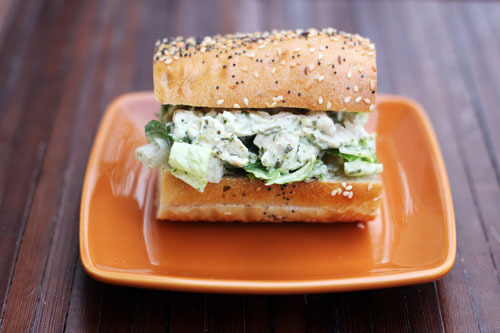 I love the in-house costco chicken salad, and often add some pesto to it for a quick lunch. Such a perfect combination! might have to give the costco salad a try! This sounds amazing. I am going to make it just as soon as my household gets over the stomach flu. hope you guys all get better soon!!!! 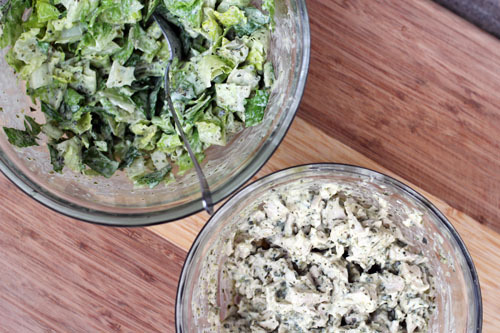 Chicken salad is one of those blank canvas type recipes that you can add so many different flavor combinations to. I make a southwest version with half mayo, half sour cream, cumin, cayenne, red bell pepper, green onion, and cilantro. Wrapped up in a tortilla and you have a new spin on chicken salad. I’ve never tried it with pesto but that sounds GREAT too! Great chicken salad. Like your idea of mixing the chicken and the romaine separately. this chicken salad sounds fantastic! Great minds think alike. I made chicken salad today. My oldest also said it was delicious. This pesto idea sounds great! My quick tip, I LOVE having the canned Costco chicken breast chunks on hand for things like this (& taquitos & enchiladas &…) Even though boiling is quite fast and my standard technique for recipes like this, the can cuts out that time and makes one less pot and cutting board to wash! I’m going to try this. Might also sprinkle a few nuts in the chicken. Kirkland brand at Costco is the only store bought pesto I like. Yum! So easy, definitely putting this in the dinner rotation next week! Moved it up because couldn’t wait and needed something fast yesterday….substituted what we had on hand: rotisserie chicken, and mixed greens instead of romaine. Served on baguette. YUM!!! I am not familiar with using pesto, do you make your own or buy the basil pesto??? I made this for my husband and kids today and it was pretty good. My only two cents would be if you’re going to use a store-bought pesto, which I did, don’t add the extra salt. Store-bought pestos usually have enough salt and adding more makes it a bit too salty tasting. good tip – I added that into the actual recipe. with the pesto I use I definitely have to use salt or it’s super bland, so didn’t really think about that! How many servings do you think this would make? We are making them for my nieces 1st birthday. Yummy! Thanks for getting back to me so quick! We are going to the grocery store this morning to pick up all our goodies for the party, so perfect timing! We are so looking forward to trying this, I will definitely keep you updated! I think we are going to use mini croissants, yummy! Have a great day! We made the sandwiches for the party today! We four times the recipe and got around 25-30 mini croissant sandwiches. Everyone loved them and was asking for the recipe! Thanks for sharing this great sammy! I love this recipe! I found it on Pinterst ages ago and make it about once a month (more in summer). It is quick, easy, light and delicious! I thought it was time to leave you a comment letting you know. Thanks!! awww, thanks! that makes me so happy! Made this tonight after having the CPK version at the airport in Dallas. This was exactly the same as CPK. My four year old and I didn’t even plate it. We just ate it straight off the cutting board!